You know our story. On Monday, we outlined that we are bullish and proud of it. But we also noted that our stance was NOT predicated on our readings from Greece or Italy or whatever, but on the pilliars on which which we build our market projections - the amazing bullish posture of today's levels of Psychology, Monetary and Valuation. We don't need to elaborate on that again this morning, but we do see so many positives starting to emerge from their cocoons that we want to share with you. I highly value the Yardeni team and the service that they provide. Their blog is a must read for everyone, so I encourage making it a habit of taking a quick look each morning. 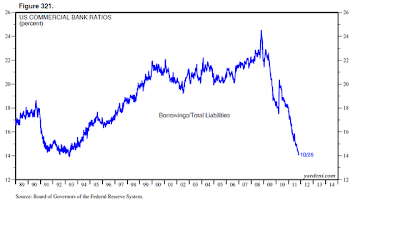 Yesterday morning, Ed posted a chart on his blog that shows a perfect comparison of how the leverage in the US banking system has gone through a major deleveraging. The system has gone full circle from the fear of 1992's crisis and the S&L debacle, to extreme leverage at the top as hedge funds and mortgages were so inviting, but it's now back to sitting in cash. 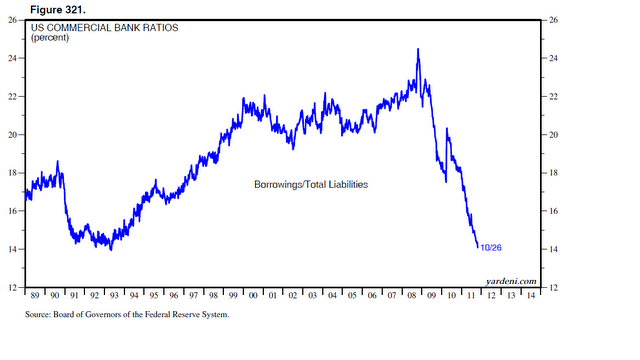 Just take a look at the chart below of the banks' borrowings as a percentage of their total liabilities. Click on the image above to view a larger chart. Source. This is a big domino in the next resurgence. The banks are about to be banks again, and they are sitting on cash. Of course, the reason for this cash is that their customers are also afraid of their shadow, so it all works together. It doesn't take a brain surgeon to figure out why our Monetary Composite that measures extremes in components like the deleveraging has such a fantastic record at seeing tops and bottoms of stock markets. It tells you the potential as soon as the dominoes start to topple setting their neighbors in action. It's also pretty obvious that the average companies (small to mid) have outperformed their big brothers, and that is a very important parameter as we watch for the dominoes to start tipping over in the right direction. 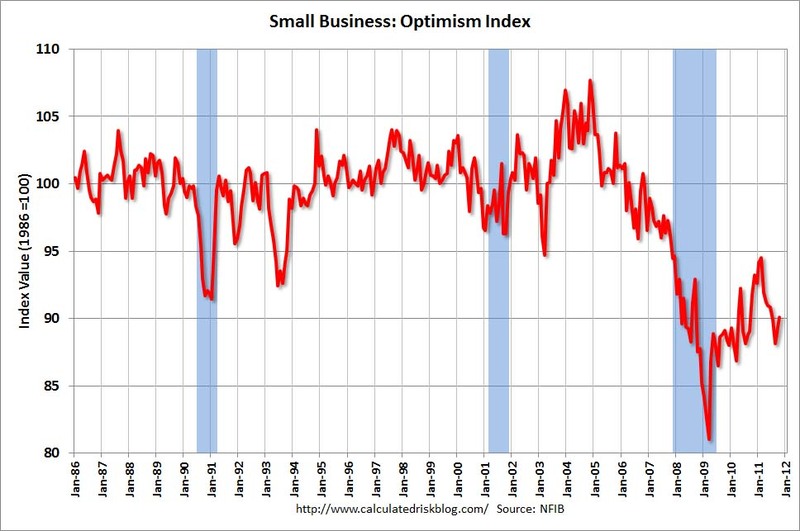 The chart below is the most recent update of the Small Business Optimism Index provided by Calculated Risk. This is not something to jump up and shout about...yet, but the increase in optimism in April and May 2009 led to the huge advance in stocks off that March 2009 low. We believe this trend will continue in the months ahead, but we will be watching this "domino" very cloesly. While we've only shown you two areas that are showing signs of life this morning, we continue to look for the good news as our Asset Allocation Model remains in such a bullish position, and we will continue to share these tidbits with you as the market progresses.